M121 | 1010 m. | 3314 ft.
On 14 June 2016 we had something very special on the agenda. Special because the tour included the first Munro I had ever climbed: The Saddle, in 1993. And special, too, as the day would see us climb Sgurr na Sgine the only Munro that had seen me turn back from it twice, both times in driving snow in winter 1997/1998. So I was utterly determined to finally bag the Hill of the Knife 18 years on. We started the hike at the layby on the A87 in Glen Shiel and followed the path leading to the foot of the steep north-east ridge of Faochag. Once we had crossed the Allt Mhàlagain we turned right and headed towards the path leading up to Meallan Odhar. I admit that was a somewhat spontaneous approach but we had been too bloody stupid to pick the old military road earlier on. Ok, no harm done. Once we had reached the Meallan Odhar path it was a steady plod up this hikers’ highway until finally the shoulder between Biod an Fhitich and Meallan Odhar invited us to have a break and to drink some water. The view towards the Forcan Ridge and the Saddle was to die for. But dying was not high on our list of things to do. So instead we continued on the path bypassing Meallan Odhar’s summit which leads to the foot of the Forcan Ridge. What can you say? The first time I had been there was in 1993 also with Frank. The climb up the ridge had been a dance up the crest. The Forcan Ridge still was real fun to climb in 2016. Its steepness, sharpness and exposure making it a great scrambling experience and I was glad that we had included The Saddle as a non-essential extra repeat Munro in this tour. No self-respecting bagger would have climbed Sgurr na Sgine alone without doing the Forcan Ridge, or would he? We made progress steadily and reached the summit of Sgurr nan Forcan in due time. Frank ahead of me. The fun continued as the way on towards the summit of the Saddle includes a short detour off the ridge to avoid a particularly steep drop and further sharp sections. Then the scrambling was over and we rested at the summit of The Saddle. Views weren’t that great due to on and off clouds blocking much of the vistas. Soon we headed south then west from The Saddle in order to descend over scree, boulders and grass to the Bealach Coire Mhàlagain. I refilled my water bottle on the way; yes it was a warm day. From the bealach we approached the northern flank of the Sgurr na Sgine/Faochag ridge. The climb was steep indeed but traces of a path helped us negotiate the steep flank of boulders which was either overgrown with grass or bare. At the Sgurr na Sgine/Faochag col the steep section was over, we turned right, strolled along the broad ridge and soon the final sharp pull towards the summit plateau of Sgurr na Sgine was completed. All that was left was to reach the flat summit of the Hill of the Knife following the path that weaves its way with some ups and downs through some bands of rock. Sunshine and mostly clear skies was what the hill offered us for our long summit break. I took off my boots and rested my hot feet on some nice Scottish moss enjoying the panorama. I must say it was worth waiting for almost 20 years before finally reaching this rather inconspicuous Munro in nice late spring weather instead visiting it in blizzard conditions that were the order of the day in 1997/1998. We completed the hike in the classical fashion by crossing the 909m summit of Faochag to descend the very steep north-east ridge of the hill which looks rather imposing from Glen Shiel. The steepness made for excellent progress down towards the glen. Soon some droplets of rain splashed onto our faces and arms but we were spared a really wet farewell from these two Munros. After the final bands of rock overgrown with bushes and trees were behind us we strolled back to our car through the meadows in the glen. This was a very, very good day. The weather was good bordering on great. The two hills are quite different in character so there is much variety: The Saddle of course being the much more exciting hill with its Forcan Ridge which is second to none on the mainland. Ach, I hope we will be still fit enough to climb The Saddle again in 2039 when another 23 years have gone by. On a second thought: Maybe let’s come back earlier. You never know. 1993 Good day for walking. From Glen Shiel up to Meallan Odhar. Up the Forcan ridge with some nice scrambling on it. Then the summit of The Saddle. Descent down to the Bealach Coire Mhalagain. Back to Glen Shiel from there. Pleasant hill-walk with nice scrambles. Next time we’ll first contact the estate if there is stalking in progress. Description These two mountains form the continuation of the South Glen Shiel Ridge westwards almost to the head of Loch Duich. The Saddle is a particularly fine peak whose east ridge, the Forcan Ridge, is a narrow rocky arete a few hundred metres long leading to Sgurr na Forcan, from where a graceful curving ridge leads to the summit. 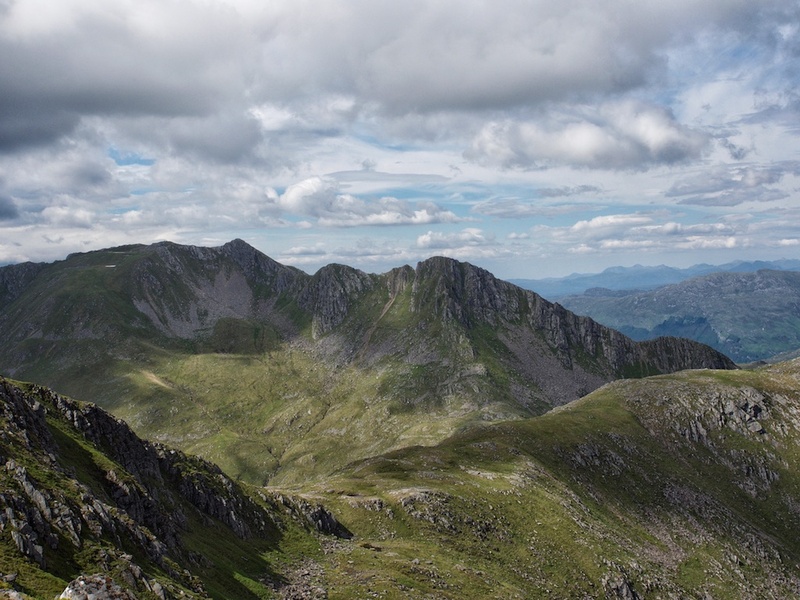 The ascent of this ridge is the best scramble in the Kintail mountains. To the west and north of the summit a long ridge curves round the Coire Uaine. To the south-east of The Saddle, Sgurr na Sgine is not well seen from Glen Shiel as it is hidden behind the steep terminal nose of Faochag, a sharp pointed peak which dominates the view from Glen Shiel. The most impressive feature of Sgurr na Sgine is its steep south-east face which drops precipitously a few metres from the summit cairn. Any traverse of The Saddle should include the Forcan Ridge. It is best reached from Glen Shiel by a stalker's path starting at the Allt Mhalagain and climbing towards Meallan Odhar. The Forcan Ridge starts from the col south-west of this hill and gives some very pleasant easy scrambling up the narrow crest to Sgurr na Forcan and onwards to the summit of The Saddle. From there make a descending traverse to the Bealach Coire Mhalagain and climb to the ridge between Sgurr na Sgine and Faochag. It is only a short distance further to Sgurr na Sgine over its North-west Top. Return along the ridge to Faochag and descend its narrow and continuously steep north-east ridge to the glen a short distance from the day's starting point.